It’s interesting. Over the last year and a half, I have taken a lot of flack because I had the audacity to encourage folks to use their food items well past the expiration date and have also advocated bottling your own butter. “You’re going to be responsible for killing people!” one woman wrote. “Who do you think you are?” said another. Well, folks, I still stand by my outlandish practice of ignoring expiration dates on food, and I don’t plan on dying from bottled butter either. But I did get a bit of satisfaction recently when one of the lame-stream media dared to support my position—albeit softly. To bring everyone up to speed, I’ve always taught that folks need not waste hard-earned money by throwing out foods simply because some corporate attorney required a specific date to be stamped on your packaging. May I remind you that these expiration dates have nothing to do with your health, the bacterial content of a food, or even taste. They are dictated by attorneys in order to prevent any unpleasant legal liability on the manufacturer. In fact, as noted also in the mainstream media article, the USDA has NO regulations requiring the use of expiration dates. Believe me, the only reason why manufacturers go to the expense of printing them, even though it’s not required, is to avoid an even bigger expense in the event something goes wrong. Seriously. I can’t stress enough that there isn’t any legal contract or dire warning associated with that little spot of ink on your food products. Now, let’s get down to butter. I think that my bottled butter and my cheese waxing articles are the two which have spawned the greatest amount of nasty-mail. Folks have been convinced that they can’t suitably boil and preserve the butter in order to prevent bacteria growth. Ok. Let’s look at this one more time, shall we? First of all, let’s see what the USDA has to say about the preservation of butter. Perhaps initially seeing their recommendations, you may realize that they are a bit overboard in their caution. First of all, they recommend that you keep the butter in it’s original container. That’s right. So all of you who dare to transfer your butter into a dish that’s more aesthetically appealing—shame on you. Next, they prefer that you freeze any butter that you’re not going to use within 2 to 3 days. They also recommend that you keep the butter in the refrigerator-but to take it out every time you want to use it and let it get to room temperature for about 15 to 20 minutes. Geesh. The USDA is starting to sound like the Pharisees and Sadducees if you ask me. Now let’s look at the reality here—and I’ve said it a bazillion times. Unless you’re introducing more bacteria, insects, and mold into your butter when you bottle it, you’re not likely to have it just develop. The reason being is because most butter is made with pasteurized milk. Pasteurized, as in stripped of all of its live nutrition (that’s another story). Not to mention the fact that butter usually has salt in it as well as a low water content—which also makes it difficult for bacteria development. As such, you’d have to work pretty darn hard to introduce bacteria into your butter when you heat it through, place it in sterilized jars, and then seal it—all with clean hands. But sure. I suppose you could develop bacteria in your butter while bottling it—if you repeatedly sneezed in the melted gold, as well as some other gross hygiene habits that I simply can’t mention here. 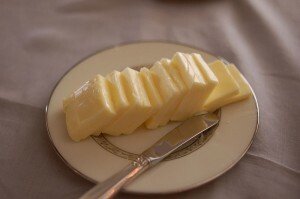 Sure our forefathers died younger than we do today, but I know for certain that it wasn’t because of their butter. Many U.S. farmers will attest that the only time they put their butter in a refrigerator is during a hot and humid summer—but that’s because they didn't have a central cooling system. The French, which have a cooler climate than we do in the U.S., are notorious for not putting their eggs, cheese, and butter in refrigeration. (I mean really. It’s not like hens only lay eggs when it’s cold enough to preserve them, right?) Again, remember, that the nose knows! While you may not be bottling butter any time soon, know that the butter that’s on your countertop is not going to cause the Department of Social Services to come and take your kids from you because of child endangerment. (At least not yet..again, another story) Just keep it covered and away from heat and light and you’ll be fine. So why is the USDA so ridiculous in their guidelines and committed to remain so? I'll tell you what my rule of thumb is. Anytime I see my government do something that makes no sense, I realize that it's usually about money and/or power. In this case, in my opinion, it's about both. If the USDA is wrong, then that means that all of the money we pay in taxes to support them is wrongfully allocated, right? If they are inept, then it lessens their political and financial influence. Bottom line, it just wouldn’t look too good for them to be discovered as a bunch of ninnies. Anything that can bring me independence and put me in a position to thrive in most circumstances rather than stress, I’m all for it. And frankly, bottled butter and using packaged baked items when I’m good and ready, does exactly that. I'm fairly new to your web site. Could you tell me where I could go to find the instructions on how to put up butter for storage? Just do a search in the search bar in the upper right hand side for "Bottled butter" and you should have several articles that come up. Good luck with it! as far as butter goes, outta the fridge... are you talking real butter or margerine? please answer... i love your site and i'm a prepper because of you!!!! Real butter is what I am referring to but you can also use margarine. Thank you for the compliment! It's interesting that I have seen three separate studies in the past couple of months that officially tested old canned foods (some over 100 years old that were in a shipwreck) and the nutrition content inside the cans had not deteriorated very much, which was a surprising outcome of the testing. I've been bottling butter per your instructions for quite some time. Your rationale makes sense; we are still alive here and one step closer to self-sufficiency. Kellene you are wonderful!!!!!!!!!!!!!! You butter canning is on my list after the veggies and fruit are done. Thank you for your wonderful information.... I wanna be your neighbor. I am trying so hard to get our ward motivated, I’m struggling. Renee, I hope this doesn't sound conceited, as it's truly is intended to help, but I have found that a fireside I give works wonders on at least a few folks. It's about how our preparedness plays into the gathering of the 12 tribes of Israel. Just food for thought. Good grief... I leave my butter out on the counter for more than a week. I am a healthy 55 years old and I have never, ever gotten sick from it. The Food and Drug people don't care a "rats hind end" about people or they wouldn't approve of all those nasty artificial long-named things in food that have nothing to do with proper nutrition. Kellene, you are appreciated more than words can say! Keep up the good work. another thing - I would rather take a chance at dying from my own food preservation than to eat the processed stuff from total strangers who could care less about the quality they are processing. Nope, I will take my chances thank you very much. I keep my butter in a covered plastic container at room temp. and have done this for several years now. I live in East Texas where it is very hot in the summer. We have AC but keep it about 78 degrees and I have no problem with it going bad. Glad to know about the cake and pancake mixes! Totally agree with you. After my fresh stick of butter is taken our of the freezer, it sits in a covered butter dish, on the kitchen counter, until it is used. It normally only takes a couple of day but nevertheless, I never refrigerate it again. Never had a problem. Don't trust the USDA as far as I could throw them! I also wax my store bought cheese in order to be able to store it at room temperature. Let me tell you something, after about 6 months is is delicious. It taste like gourmet cheese that I paid a fortune for rather than plain, old cheddar cheese I bought on sale. I think it must lose a little of it's water and the cheese flavor intensifies. I love it. I worked in a dairy for over 3 years and would gladly leave my butter sitting out for a month. I have never been sick from butter or oil for that matter. I have smelt what bad oil is like and would be smart enough not to eat it. My sniffer still works for me and will use that to determine when something is bad instead of an expiration date! I have left butter in a butter dish for a month or more and never had a problem other than it looks more yellow on the out side and white on the inside. What about eggs what is their shelf life? I'd suggest you look up the articles on "Preserving Eggs" on this site for that info. I try all of Kellene's ideas out. I had eggs last for 6 months with the mineral oil treatment. I did not flip them daily all my Navy buddies suggested. My bad, trust me you can trust the sniffer test on that one. I stored them at 60-65 degrees and dark and dry and they lasted 6+ months. Not bad for store bought eggs and someone just learning. If it smelled bad/off I tossed it. yes I worked food service and had a maniac manger that was a clean freak. He wanted microbes killed cause he wanted customers. Giving folks food borne illness is not a way to build repeat business. I got my pressure cooker, I'll be canning bacon for $1.50 per pound or less, or butter at $1.50 per pound. How about cheese waxing? Do these things need a few tweaks of course they do. But I'll be eating good when all of the "food police" are chasing their tails. Sorry a bit of arrogance showed. darn I'm trying to cut down on that arrogance. I don't think I'm succeeding. If I can do it you can do it as well. A few sacrifices on your part but heck if it was easy anyone could do it. That's why they don't sacrifice for the future. It really is simple to be a prepper, though not easy. but you have to ask yourself,Are you or your family worth it? I can only repeat the same for the above. I too break a hard stick of butter in half and toss it in a small plastic tub with a lid on my kitchen counter. It sits until used up completely and that can go as long as four or five days for my husband and I. I use a Rubbermaid brush to paint toast or corn on the cob right from the container and still have had no problems in keeping or using the butter this way. As for flour products, I have been using vacuumed sealed 5 pound bags that have been stored in my basement for over 3 years past expiration dates. It is the basic all purpose flour and never has it been a problem. The industry wants us to waste our commodities and spend more money, but I am not one so easy to comply with all their rules of profit. The nose knows! Oh, almost forgot. Off topic slightly here, but on the subject of canned goods. They only store bought canned good I ever had an issue with was a case of tomato soup that had gone 2 years past expiration. The case had been on a shelf I had forgotten and when I opened a can and began eating, I noticed a very slight metallic taste but not so overbearing that I could not eat it all. I believe it was the high acidity in the tomatoes that caused the bitterness or metallic taste. The cans were eaten rather quickly, but there were no bad after effects. Another good write up Kellene. With this antique or (French) butter crock, we can leave our butter on the counter for a month and have soft spreadable butter at our command. 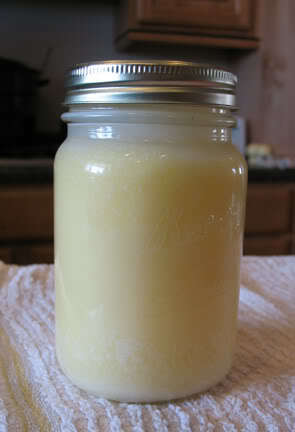 I keep one stick out of the fridge, the rest of it goes in the freezer, though eventually I WILL be canning my butter. I keep one stick, the one I'm using, out of the fridge, on the counter, covered up when I'm not immediately dipping in to it. I'm not skeered (or sick from eating room temp butter!)! I went to the article on Care2, the author of that story clearly doesn't have any facts or experience to back their story, and the poll is a joke, it is not clear at all, it's just fear mongering. Thanks for writing your stuff. it's good to have someone writing good common sense. How do you store your cake mixes for them to last? do a search for "foodsaver" G, on this site. There's TONS of info I've posted here. Could you share the fireside? I have tried to motivate my ward as well, without much success. I did a program earlier in the year and found that only two people were pretty much fully prepared for emergencies. No one else raised their hands. What will motivate people? knowledge, testimony and a good "why" motivate people. e-mail me privately about this and we can discuss further, Melanie. Just came across your website. It's wonderful reading some great common sense. We live in the subtropics and except in the middle of summer (no air con) the butter lives in the pantry. I didn't know you could bottle butter. Beside that, I agree that the sniff test is a much better assessment of food 'offness' that any date on the package. Just as a side note, Utah State/BYU's head of the research department for cooperative extension (the people that perform studies on food storage, etc.) said that each study or project costs around 10 to 15 thousand dollars to carry out, and most of the time, they qualify for grants in certain areas to fund it. 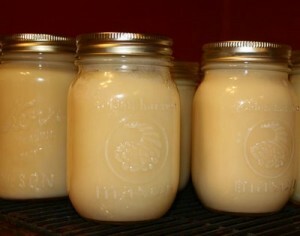 If a private party came up with money to fund the research on bottling butter, they would do it. It has come up several times as an area of interest. They are always performing studies and welcome volunteers to help if you live nearby. I thought this information was interesting as I never knew you could essentially suggest and fund your own study. The problem with the butter is not bacteria added /during/ processing, but rather the new anaerobic condition caused by processing and storage temps afterwards. The clostridium could be there before, introduced during processing, whatever. Doesn't matter. 1. anaerobic. Check, we got that! All set for a botulism hoedown. Party on! Not saying one shouldn't do it for themselves; it's your life. I'm saying advocating it in public does not meet the high quality standards of this blog and may actually cause harm. I'm sorry to disappoint you, but I'm afraid that's one opinion on which I won't back down. But just like anything on this blog, folks can accept or reject, and I pray that anything they accept will be done according to their own influence. This is one more reason why Spiritual Preparedness is the first and primary principle of preparedness--so that folks can know for themselves and discern between truth and error. There's nothing more offensive to the taste buds than a sour dig dipped in sugar. Some great articles here! Another place where expiration dates are often way off base is on medications. I believe there's a Defense Department website that actually lists the shelf-life for lots of medicines, and they are years longer than the usual expiration dates printed on the bottle or prescription. There are some exceptions, though. I think it was tetracycline turns seriously toxic and it's expiration date must be respected. There may have been others. Thought I had added the website to my favorites, but can't find it now. I'm new to pressure canning and I'm sticking strictly to the guidelines at this point, so no butter for me. I canned browned ground beef for the first time a few weeks ago, and raw pack chicken breasts last weekend. The ground beef smelled a little like pleasant smelling dog food when we opened a jar, but tasted quite good in a stroganoff noodle dish. Haven't tried the chicken yet but it looks good. You might also want to consider ghee. Just pour it into a jar and it seals itself. It's used in countries with no refrigeration, is great for cooking, and the casein is cooked out of it so it also works for a no casein diet. Thanks for this. It's pretty expensive to buy pre-canned. Had no idea I could do this myself. Muuuuuch cheaper as I already have everything but the butter. I think if you watch for the sales and use coupons you'd discover that you can get a lot of precanned produce and meat for much cheaper. I don't can much except for meat and butter. We always leave the butter at room temp. We have no air conditioner, so when it gets very hot outside and warm inside (So CA coast) and it's melting, then it has to go in the frig. We've never had a problem with butter left out. Of course we do eat it up quickly--by the half pound! 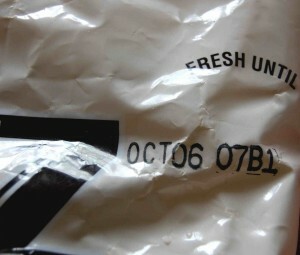 I would suggest the movie "Dive" for anyone who wants a different perspective on expiration dates. It is currently on Netflix. Nice to read what you have to say about expiry dates. I read them, then ignore. No deaths to date. Check the cans, smell the product. Butter is left out on counter covered or uncovered. Only problem is if big dog counter surfs to steal uncovered butter, that's the biggest issue! Makes for a sleek coat. I did have some discounted cornbread mixes go bad, dog loves them. A couple of months ago a co-worker brought some rancid saltines to work. You could tell from across the table that they had gone bad. PHEW!!!! Enjoyed seeing you and hubby on Nat Geo. Low and slow is the key. If you have a solar oven, I'd definitely suggest using that instead. I found that there was a huge difference in the taste too! If you're picky about chicken, then check out the Zaycon label here on the site. (Or you can look up the article on it.) It's the BEST chicken meat I've ever purchased and it's SUCH a good deal. As a result of their referral program, I got my boneless, skinless breast for only 98 cents a pound. This last sales event they had bacon and I got the Zaycon bacon for only 53 cents a pound. This month they are doing honey in my area and I'm ending up paying only 20 cents a pound because of the all of the referral dollars earned through Zaycon. It's AWESOME! I love your articles and recipies, but with all the buttons, you don't have a print it or save it PDF button. That would help us archive your articles and recipies for future use. God bless you. That's because we don't encourage a violation of our copyright policy. Thanks. Find a free PDF printer (I have used both PDFCreator and CutePDF Writer; either will work well). Then anytime you want a PDF of anything – just hit print and select the PDF printer. Archiving something is not in any way a violation of copyright, so no worries on that front. Just don’t republish them without permission, which I assume is what the blog owner was concerned about with that comment in reply to you. I don't think butter IS a low-acid food. Think about it this way: Butter, tallow, and lard, all of which have roughly the same water-bath canning directions, are FATS. Fats are composed of various FATTY ACIDS. This being the case, doesn't that make them a high-acid food? I have not yet canned butter, but I have canned lard and tallow, and, if I ever have enough spare butter to make it worthwhile, I would can it. I keep an old wire-bail top crock that once contained cheese spread on my counter, with butter at room temp. Works just as well for me as it did for Mom. And the wire bail top keeps my kids out of it--they will eat butter out of the crock any chance they get! LOL! I just bought expensive organic valley butter and hadnt opened it at all! I found the expiration date to be today and was deathly afraid that I have to throw out 10 dollars worth of butter. I realize that I am writing this 3 years after the last post but hope you will read it anyway. I was born and raised in the country by parents born before and who suffered through the depression. We had vegetable gardens, fruit trees. raised our own beef, canned and froze everything including dandelion greens which grow in abundance lol. Little was bought at the store and I never got sick from food until I went to college and out in the world. I went to college and got degrees in Biochemistry and Chemistry and my special love was botany. Among many things in the 28 yrs of my research and production I designed and produced the testing procedures and reagents used for nutritional labeling for an International Chemical Co in the US. This is all in aid of the following: they sent me to a class on the chemistry of food. Interesting enough and surprising to me (should not have been) 99% of food spoilage is fatty acid oxidation layman's term = fat spoilage. Most bacterial spoilage will have little to no smell at all, but fat spoilage will smell to high heaven and certainly even in the early stages will be easy to detect. Fat spoilage will not always be detrimental to your heath but I will bet not many people will be able to keep the food down. I just found your web site and will read with interest your articles. I came on here to find info on how long butter was good past the expiration date and found so much more - thanks for taking the time to pass on practical advise and measures on food use and preservation. I do have to pass on a snarky comment on the FDA, in all the years I HAD to deal with them, interestingly enough I never spoke to anyone who spoke English as a first or even second language. Most of the time they were totally impossible to understand - Russians, Chinese, you name the country and they all treated us ie Americans like we were an inferior animal species and hardly worthy of their time or trouble - that is who is running the FDA. Some would not talk to me because I was a woman and obviously a secretary of some sort. Who hires these people, are there no US scientists that can fill these positions? They have to hire from out of the country? If I treated anyone the way they treated me I would and should have been fired. There are laws about that type of behavior but I guess it doesn't count if you work for our government. End of rant. I have country crock honey spread that is out of date jul 15 2013 my husband and i debate on rather or not to eat it .What do you think . I wouldn't eat that synthetic stuff even if it wasn't expired, personally. Sorry. You're asking the wrong person on that. I just had a bowl of popcorn I popped in the microwave with butter. It tasted great...until I realized the butter was two years old. Didn't smell bad. Tasted good. If I make it to tomorrow I'll let you know. I just pulled some butter that may be over 2 years old out of the fridge. After cutting the yellowed outer portion off, it revealed perfectly fresh smelling and tasting butter. I put it in some vegan pea soup (no fat=no taste) and am enjoying it now. I may regret it in about 12 hours but I doubt it. I think with the case of butter, if it smells and tastes fine, it is edible. I went to boarding school in the UK where I ate butter that had been sitting at room temperature in the breakroom for days. I can confirm from that it will make you spit it out in disgust long before it will make you sick. My butter sits at room temperature everyday of the week as I use it. Just on the counter in its butter dish.